“Why she left us” by David Dennis on the surface is a compelling tale about three sisters and their muddled love life. Their mother, an amorously restless and seemingly selfish and disinterest woman, and their aunt, unhappy and single, have little influence on them. Not surprisingly it is two young men who drive the plot forward, and the rivalries over the two and between the two men as well. On a deeper level the book deals brilliantly with the issues of self worth and the desire to be loved. Told by various separate narratives the book allows great insight into the motifs and the thinking of five characters within the story. Although this had me at times a little confused about the plot, it allows us to feel intensely the pain, confusion and desires of those chosen characters. It also works incredibly well for the unfolding of the story and some of the twists and surprises to come. A lot is implied but not said until much later, keeping suspense and interest at a high rate. What distinguished this book from coming of age and superficial teenage literature and makes it so precious is the non-stereo-typical characterisation, the clever plotting and the raw insights the author provides into his characters’ psyche. This is an intense and emotional read, one that is hard to forget easily and one that should do well in literary circles. […The author’s] gift to the literary world is that he dignifies and honors the struggles, travails, and passions of these humble people for whom college attendance would be like completing a marathon for most of us. There is no sermon anywhere in here. Even the most spiteful act is understood; lust is accepted, and when coupled with a rush of spirit, is honored. Only one character shows ill throughout, and that is Carl Peters, who lives in resentment that the world hasn’t given him his every whim. Carl shows a horrid dark side, which will allow this book to be used as a study in psychopathy. However, even Carl’s malevolence evolves over the course of the book. I taught English to seventh-grade students for a period of 28 years, having retired in June 1999. Throughout the years, I’ve usually had my nose in a book, whenever I wasn’t listening to opera and classical music, or performing in community theatre, or weight-lifting – a rather strange mix of activities, I’d say. Even though in my younger years I was something of a performer (either as a teacher or as an amateur actor), I’ve always been primarily an introvert. I suppose that the trite old expression “Still waters run deep” applies to me a good deal. Writing was something I did in my spare time. Now that I’m retired from teaching, it’s something I enjoy doing even more, especially since it’s a lot easier to get my thoughts on “paper” now that I’m not restricted to using my old Underwood typewriter. That old typewriter got a lot of use, even when I was in 5th grade and began writing little adventure stories that, at the time, I thought were both exciting and amusing. Have you published anything else? If so, please tell us about it. 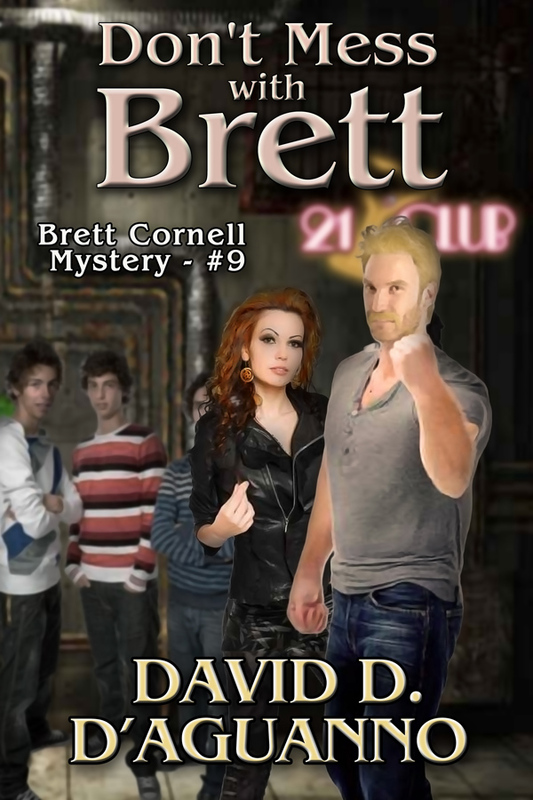 In addition to the novel “Why She Left Us”, I have published nine books in my series of Brett Cornell comedy-mysteries. These novels are deliberately written in a tongue-in-cheek style and feature a crass, wise-cracking private detective who’s something of an anti-hero, as he struts through each of the novels, wreaking more havoc along the way than the murderers and criminals themselves whom he gets hired to investigate or track down. They’re meant to be breezy, lightweight entertainment – not to be taken seriously, in fact, since a real-life Brett Cornell would be someone you’d definitely want to have as little to do with as possible. How did you come up with the idea / story for this book? Who or what inspired you? The idea for “Why She Left Us” originated as a sub-plot in a huge family saga that I was writing during my college years. Decades later, I decided to develop this sub-plot into a stand-alone piece of writing, prompted mainly by the personalities of the characters involved, as well as the dramatic and even tragic possibilities that the story-line entailed. Did you ever entertain the idea of a linear narrative for the story? Since all of my other writings were created in a fairly traditional and conventional manner, I wanted to try something different with this work. Hence, the idea arose to utilize multiple narratives and a timeline that bounced back and forth from the past to the present. The main message of the book deals with the idea that the loss of an individual can often have a profound effect upon those who are left behind, often in such a way that one doesn’t realize right away that such a thing is actually happening to them. For example, one of my characters mentions that, even while attending the funeral of the recently deceased person involved, she couldn’t think of a real reason why she should be grieving at all. Later on, as the reader finds out, the death of that person has drastic repercussions for her own life – perhaps even more so than many of the other characters in the book. Did you know what was going to happen in the book before you started writing or did the story unfold itself and forced you to re-write? I actually knew from the start how the whole story was to be played out. In that way, I was able to provide little hints, here and there, as to what was behind a certain character’s decision to do what she did on the fateful day of September 4, 1985. Did you have any actors or actual people in mind when wrote your characters? When I wrote the first draft (many years ago, as it turns out), I was thinking of some of the then-popular actors and actresses. Nowadays, I’m thinking mainly of Australian actor Chris Hemsworth for the role of Wayne Brown Junior and British actor Nicholas Hoult as Carl. The female characters, I think, would be tougher to cast, as I see it right now. I enjoyed writing the character of Wayne Brown Junior quite a bit, mainly because I found it challenging to be able to elicit sympathy for a character who remains largely silent throughout the novel but who’s misunderstood by some of the more prominent characters with whom he gets involved. In a way, I guess I’m a little bit like all five narrators (even the women), although comparing myself to Carl may seem alarming to people who have already read the book. Let me just say, then, that Carl and I both share a tendency to feel a bit self-important from time to time – although I sincerely hope that I’m not as obnoxious about it as Carl is! Self-publishing, for me, has been mostly a lot of fun. I still remember how excited I felt when I actually saw the book cover image of my first Brett book (“Poolside with Brett”) upon its first appearance on Amazon. Unfortunately, I wasn’t quite prepared for all the competition my books were up against, with such an incredible number of books being released every single day! I’d advise new writers to try to exercise patience in not rushing to see their books in print, without their writing having undergone some serious editing and, most of all, some serious contemplation. After finishing a book, it’s usually a good idea to literally stay away from it for about 2 weeks, then go back and re-read it and analyze the sort of impression it’s making on you. In the mystery genre, I’ve always been a huge fan of Agatha Christie, but as time goes on, I find myself drawn more and more to writers from the past, such as Henry James and Anthony Trollope. I’m currently stuck halfway through Trollope’s “The Bertrams.” I have it both in paperback and in Kindle format. Initially, I think I was a bit too sensitive about it. 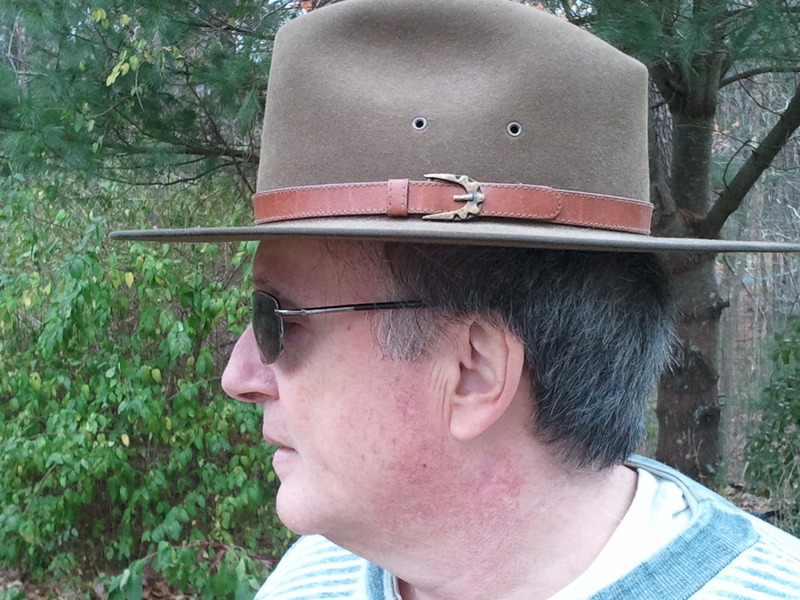 Gradually, I’ve come to realize that my writing – especially my Brett books – may not appeal to everybody. For example, “Brett Always Wins” has received mostly five-star reviews, but also a couple of one-star reviews, claiming that the book was a waste of time. I had to laugh! One weird thing about the city I live in is that it has probably more churches per square mile than any other city in the area, and at the same time, the highest crime rate! One nice thing is that, in my immediate neighbourhood, most of the residents are either at work or at school during the daytime hours, so I can concentrate on my writing/reading in a relatively quiet atmosphere. I also happen to love my house (it’s the right size, and I feel relaxed in it), but everyone’s always telling me I should move into a nicer place! At the moment, I’m not doing any writing, but I think that a tenth Brett book will be coming out before too, too long. 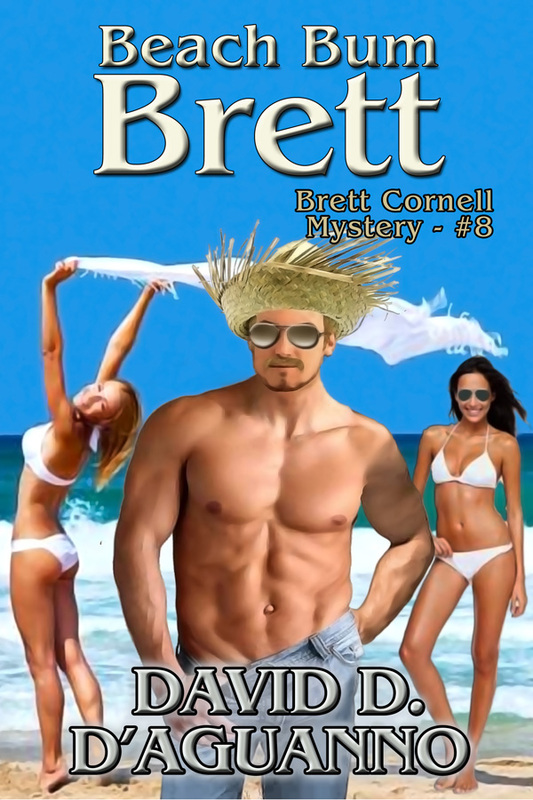 As far as the Brett Cornell Series is concerned, I’d be happy if readers simply got a few good laughs out of reading them and didn’t take the character of Brett too seriously. With “Why She Left Us”, it would be great if readers found themselves totally immersed in the storyline and in the characters and, most of all, if the book were to deeply affect them on either an emotional or an intellectual level (or both). Don’t let the silly titles fool you, these Brett novels are jam-packed with interesting situations and characters, riveting action, and surprisingly, tons of complex human interaction. And of course they are hilarious. Over the top? Yes. But that is how the series was designed, for those that missed that point. Mr. D’Aguanno deftly shifts from one interesting environment to another, and I felt as though I was sitting or standing in the vicinity of Brett and the other well defined characters. What I’m wondering is if this might become a series, because it seems like it is tailor made for a fun TV show. Thanks Belinda, nice to meet you and I am looking forward to following your blog, too! 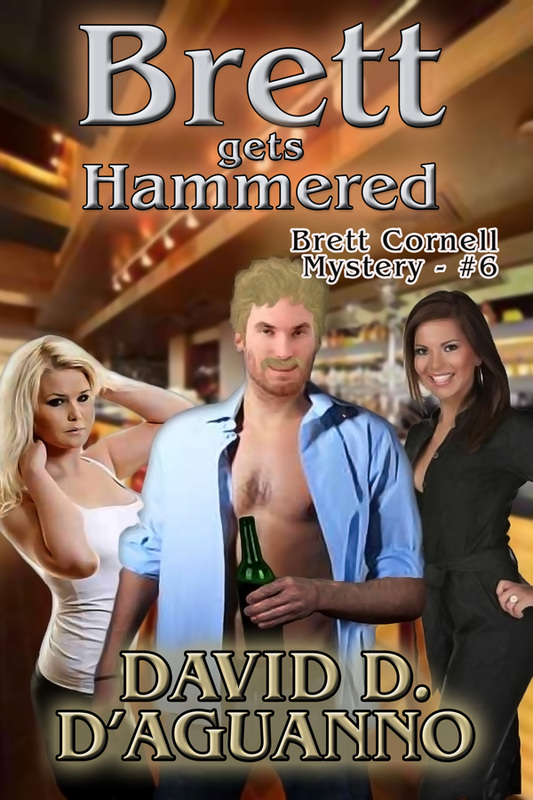 Sorry to say, the Brett covers DID get to me. Won’t be caught dead! Well, maybe if you paid me. The other book though, Why She Left Us, looks very intriguing. Nice job. The Brett series is very different from Why She Left Us, and certainly written not for the same audience.